Whether you are having a traditional religious ceremony or a more informal event Order of Service will guide your guests through the ceremony itself. Traditional orders of service will take your guests through the details of the ceremony but also provide a prompt for hymns, blessings and prayers so that the congregation knows what to say and when. Religious orders of service can be quite long and tend to suit a booklet style best. 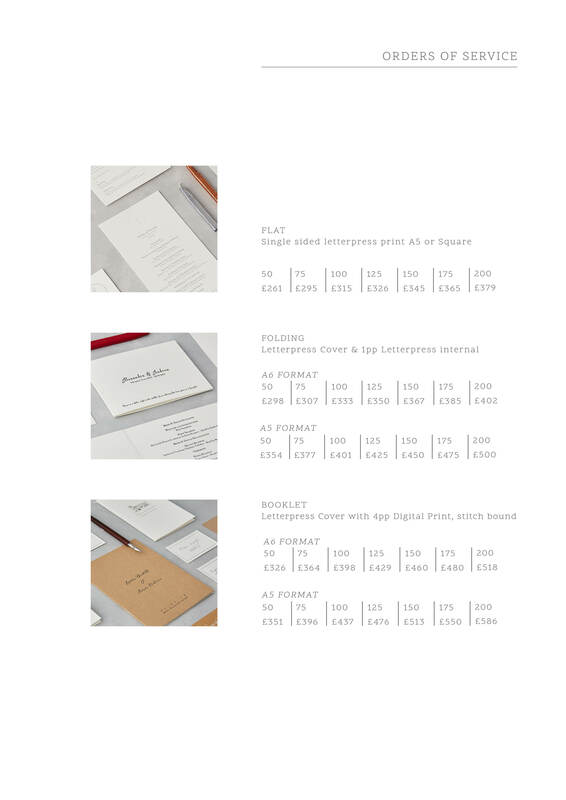 These will usually include a letterpress printed cover on card and 4/8 digitally printed internal pages. Modern weddings are often a mixture of different cultures, heritage & religion, with many guests having completely different associations for the big event. So a simple order of service can help guide your guests through a civil ceremony too. Folded or single letterpress printed cards work well for a civil ceremony. Whether having a religious or a civil ceremony the guidelines to what you can or can't include in the service can be quite strict (particularly in the UK) so please double check with your officiant as to what is allowed. Wedding Orders of Service can be printed in the same style as all our Ready To Go wedding card designs - we can also personalise the design with an illustration of your wedding venue or monogram.